Ben Greenfield is an ex-bodybuilder, Ironman triathlete, Spartan racer, coach, speaker and author of the New York Times Bestseller “Beyond Training: Mastering Endurance, Health and Life” (http://www.BeyondTrainingBook.com). In 2008, Ben was voted as NSCA’s Personal Trainer of the year and in 2013 and 2014 was named by Greatist as one of the top 100 Most Influential People In Health And Fitness. 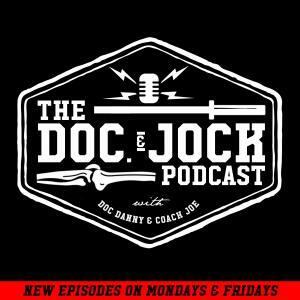 In this episode of the Doc and Jock Podcast Ben Greenfield joins the conversation. Ben opens the show buy describing his PILLARS of fitness and how he tracks each. Ben writes extensively about each of these primary modes but here on the Doc and Jock Podcast you get the Cliff’s notes straight from the horse’s mouth. We find that Ben prioritizes 6 factors; performance, recovery, sleep, fat loss, and hormone optimization. Ben not only describes why he feels these factors are paramount toward optimizing human function but also provides insight on how he monitors them. Ben also talks about the group training model, discusses his thoughts on the power of the human mind, and discusses his recent experimentation with free diving and exogenous ketones. Ben is one smart cookie and we are very fortunate to be able to share his message with you, the Doc and Jock audience. Please gang, if you enjoyed Ben’s episode and the information he provided head over to iTunes and leave a review and comment. Rumor has it that Ben combs the reviews of podcasts that he does and counts the times his name is written. It’s just a rumor, but you know how those start! Ben walks Danny and Joe through his points of emphasis as a coach, Performance, Recovery, Digestion, Brian, Sleep, Fat loss and Hormone Optimization, and the ways he monitors each. Ben provides some insight and goes into further detail regarding heart rate variability monitoring and how monitoring it can positively affect CrossFit Training. Is it feasible implement the type of monitoring described above and earlier in the conversation in group settings, like CrossFit. Getting around life with kiddos. Can you have your cake and it to? Ben discusses his personal experience training for Ironman competition post kiddos. There are not only benefits for the athlete but there is research to show that kiddos benefit as well. The power of the mind. What type of mental preparation does Ben implement in his own training and in that of his clients? Ben describes the impact of Free Diving on performance and how exogenous ketos can effect breath hold times. Where to find Ben and the content he creates.